I wanted to have my Ruby Camping-based web applications act as OAuth providers now with 1.0a. 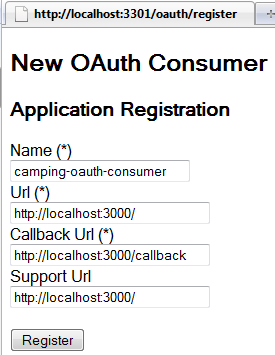 To make that happen I needed some kind of Camping OAuth plugin. Since none existed it was time to build one! Before we can dive in the making of the Camping OAuth plugin here is a quick overview of the basics of the OAuth functionality. OauthToken Authorization tokens are exchanged between the consumer and the provider. RequestToken The Request Token is a temporary credential token used to authenticate the Client Application (consumer app) at the provider site. This token typically includes the key and secret issued by the provider for the consumer. Once a Request Token has been authorized, an OAuth Verifier is issued. The verifier is a verification code which will be passed back to the client application for use in subsequent requests. AccessToken The Access Token is the authorized token the Client Application (consumer app) needs to pass to the provider every time it wants to invokes a given API on the provider site. The Access Token is issued once the Request Token has been explicitly authorized by the user logged in at the provider site. OauthNonce A combination of a number used only once and a timestamp. The nonce is used to prevent replay attacks during during an OAuth exchange. oauth/request_token Allows the consumer app to provide the key and secret associated with the user’s registration so that an OAuth RequestToken can be provided. oauth/access_token Allows the consumer app to obtain an OAuth AccessToken, based on an OAuth RequestToken and an OAuth verifier. 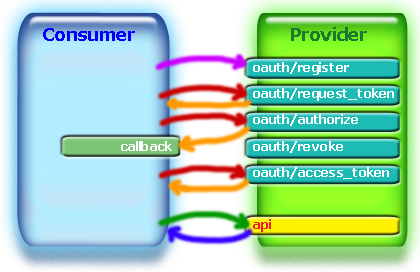 The OAuth AccessToken can then be passed to the provider when invoking provider APIs. Ruby-OAuth is primarily used for an OAuth consumer application or site to request access to data hosted by an OAuth provider. So how do we actually build a provider? Well there is another gem called the oauth-plugin, which was primarily designed to easily add OAuth provider capabilities to a Rails web application. Let’s install it too. 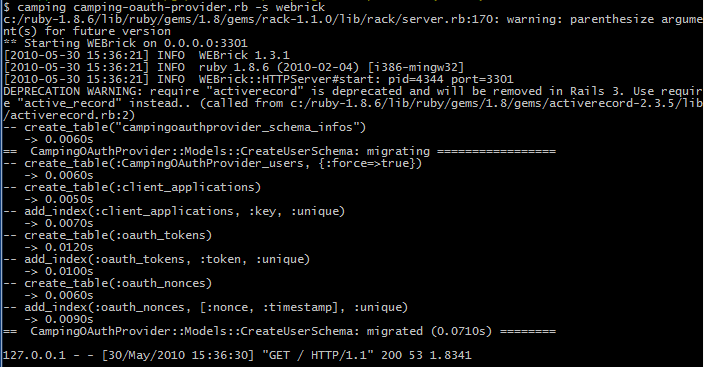 Although you can use the Ruby-OAuth gem to act as an OAuth consumer, there was no provider plugin like for Rails. So I stated thinking: “What would _why do?”. If the OAuth Plugin’s approach is based on generation to fit the Rails approach (with script/generate), then the Camping approach would have to be based on meta-programming. Let’s dive in the approach (or skip to the next section on how to add OAuth provider support). I decided to try to leverage as much as possible the templates and utility code from the oauth-plugin, but without duplicating the code. Pelle was also gracious to allow me to do so. Common helper methods related to user management, logging, etc. These classes are “mixed in” by reading the oauth-plugin model templates and applying them using module_eval. including the OAuthCampingPlugin::OAuth and OAuthCampingPlugin::Helpers modules in each of the Camping controllers using class_eval. 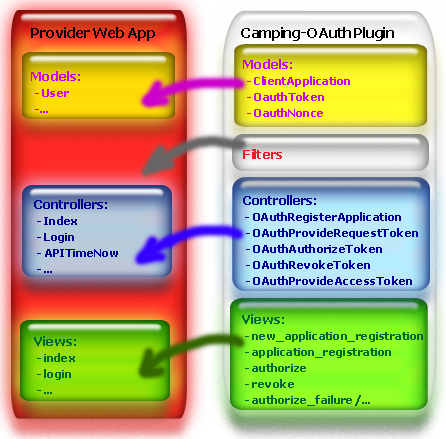 including the OAuthCampingPlugin view methods in the application’s Views module using module_eval. Note: if you are interested in Ruby metaprogramming, check-out the reference section. 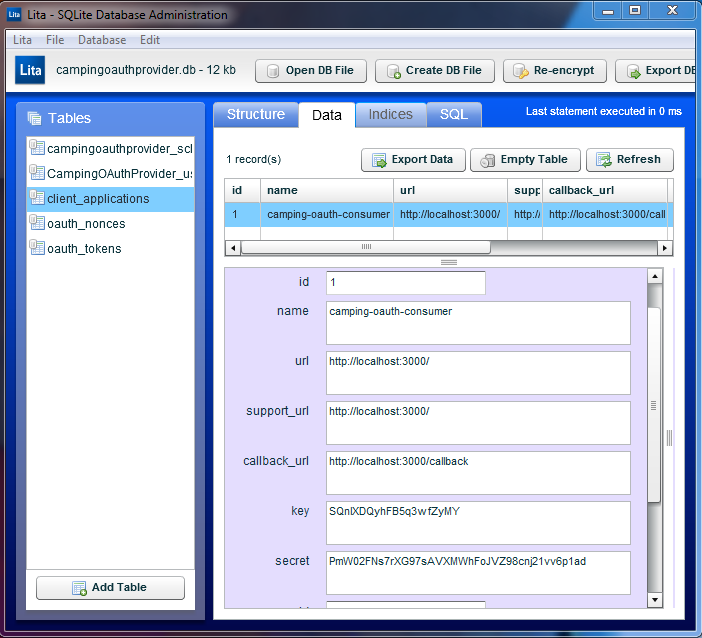 This gives us the ability to leverage a logger for the camping-oauth plugin. Now let’s customize the create method by adding a call to OAuthCampingPlugin.create, so we can give the plugin to run any needed initialization. Ok, at this point we have a minimally configured application module. Our next step is to move on to the Models module. Now we need a CreateUserSchema migration class to define our database tables for User, and OAuth models. In the up and down methods we will plugin a call to the corresponding method from the OAuthCampingPlugin::Models module to create the tables for ClientApplication, OAuthToken, and OauthNonce. Before we continue fleshing out the logic of our controllers, let’s finish hooking up the Views module. And now add the corresponding login view in the Views module"
Since the camping-oauth plugin installed a :before filter on the OAuthRegisterApplication controller requiring user login, you should be redirected first to the login page. Since we created a default account when running the migration, login as admin with camping as the password. 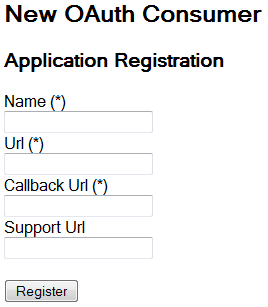 Once logged in you should be redirected back to the OAuth Application Registration page. As a side note, you can style all common OAuth views later using CSS. We'll let you add the SignUp controller and its signup view on your own. 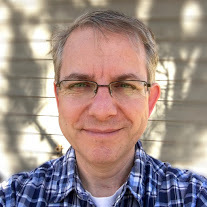 Since the premise of this post was to make it easy for web apps to consume an OAuth-protected service, let's create a very simple controller (no view needed) to expose some data as JSON. So now if we logged out (by deleting the session cookies since we have not implemented logoff) and refreshed our browser we would be redirected to the login page. The key and secret will be used by our consumer as credentials when accessing our OAuth provider, so copy/paste them into a notepad. Note: if you are interested in Lita, an AIR-based SQLite administration tool, see here. You should get back the url to authorize the specific request token you just obtained. Also if you look in the examples folder of the camping-oauth gem you will find the full source for both a provider (the one we have been working on) and a consumer app (to be run on port 3302). OAuth has become a key enabler in authorizing data sharing across web sites. OAuth also "plays nice" with identity and authentication solutions such as for example OpenID. Ruby and Camping make it very easy to develop web applications and web services (whether you support JSON, XML, with or without REST). Note: if you're interested in REST support for Camping web services check out RESTstop. With the camping-oauth plugin you can easily and quickly allow your services or web app to be accessed from other services. So hopefully this post will have given you a feel for how easy it is to make a Ruby Camping-based web app act as an OAuth provider using the Camping OAuth plugin.